In what follows are various transformations and projections, mostly as they apply to computer graphics. The stereographic projection is one way of projecting the points that lie on a spherical surface onto a plane. Such projections are commonly used in Earth and space mapping where the geometry is often inherently spherical and needs to be displayed on a flat surface such as paper or a computer display. Any attempt to map a sphere onto a plane requires distortion, stereographic projections are no exception and indeed it is not an ideal approach if minimal distortion is desired. A physical model of stereographic projections is to imagine a transparent sphere sitting on a plane. If we call the point at which the sphere touches the plane the south pole then we place a light source at the north pole. Each ray from the light passes through a point on the sphere and then strikes the plane, this is the stereographic projection of the point on the sphere. In order to derive the formulae for the projection of a point (x,y,z) lying on the sphere assume the sphere is centered at the origin and is of radius r. The plane is all the points z = -r, and the light source is at point (0,0,r). The cross section of this arrangement is shown below in what is commonly called a Schlegal diagram. The distortion increases the closer one gets to the north pole finally becoming infinite at the north pole. The following example is taken from the mapping of EEG data recorded on an approximate hemisphere (human head). The data can be rendered on a virtual hemisphere but as such the whole field is not readily visible from any particular viewpoint. The best option is to view the data from the top of the head but the effects around the rim are hard to interpret due to the compression of information as a result of the curvature of the surface. The following shows a planar projection from the hemisphere on the left and the same data with a stereographic projection. The compression near the rim is clearly reduced greatly improving the visibility of the results in that region. Note that in the above, after the projection has been performed, the resulting disk is scaled by a factor of 0.5 in order to retain the same dimensions as the hemisphere. Also sometimes known as a cylindric projection. 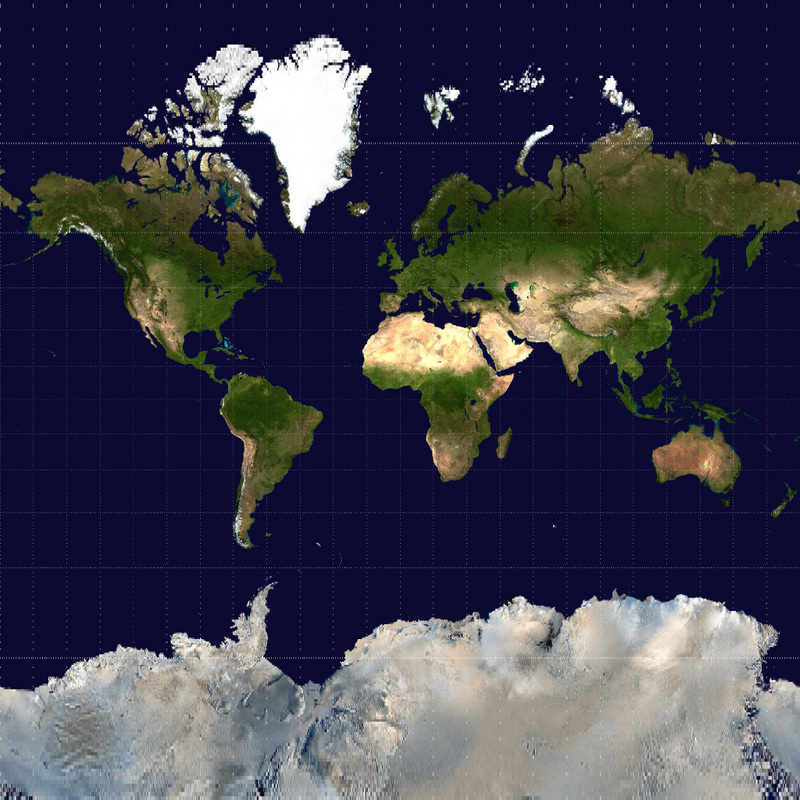 The general cylindrical projection is one where lines of latitude are projected to equally spaced parallel lines and lines of longitude are projected onto not necessarily equally spaced parallel lines. The diagram below illustrates the basic projection, a line is projected from the centre of the sphere through each point on the sphere until it intersects the cylinder. A Mercator projection is similar in appearance to a cylindrical projection but has a different distortion in the spacing of the lines of longitude. 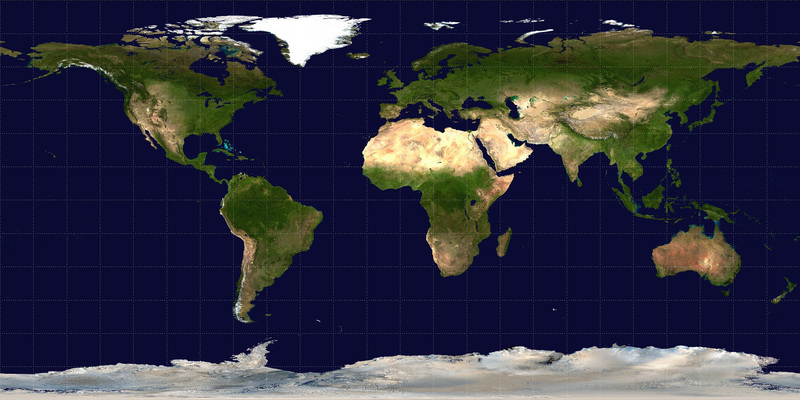 Like the cylindrical projection north and south are always vertical and east and west are always horizontal. Also it cannot represent the poles because the mathematics have an infinity singularity there. This is one of the more common projections used in mapping the Earth onto a flat surface. There is not a single Mercator projection because one can choose the maximum value for the latitudes, a common convention is illustrated below. The equations for longitude and latitude in terms of normalised image coordinates (x,y) (-1..1) are as follows. Cylindrical projections in general have an increased vertical stretching as one moves towards either of the poles. Indeed, the poles themselves can't be represented (except at infinity). This stretching is reduced in the >Mercator projection by the natural logarithm scaling. While not strictly a projection, a common way of representing spherical surfaces in a rectangular form is to simply use the polar angles directly as the horizontal and vertical coordinates. 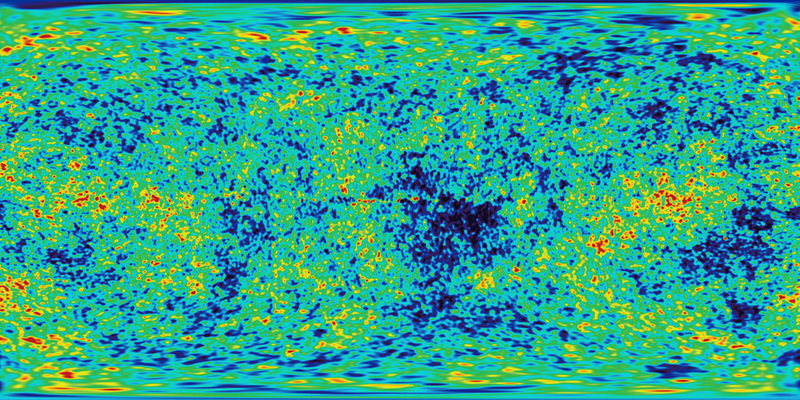 Since longitude varies over 2 pi and latitude only over pi, such polar maps are normally presented in a 2:1 ratio of width to height. 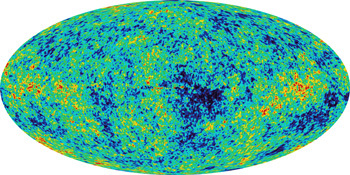 The most noticeable distortion in these maps is the horizontal stretching that occurs as one approaches the poles from the equator, this culminates in the poles (a single point) being stretched to the whole width of the map. An example of such a map is given below for the Earth. While such maps are rarely used in cartography, they are very popular in computer graphics since it is the standard way of texture mapping a sphere.....hence the popularity of maps of the Earth as shown above. An Aitoff map projection (attributed to David Aitoff circa 1889) is a class of azimuthal projection, basically an azimuthal equidistant projection where the longitude values are doubled (squeezing 2pi into pi) and the resulting 2D map is stretched in the horizontal axis to form a 2:1 ellipse. In a normal azimuthal projection all distances are preserved from the tangent plane point, this is not the case for a Aitoff projection, except along the vertical and horizontal axis. A modification to the Aitoff projection is the Hammer-Aitoff projection which has the property of preserving equal area over the whole map. Consider longitude to range between -pi and pi, latitude between -pi/2 and pi/2. 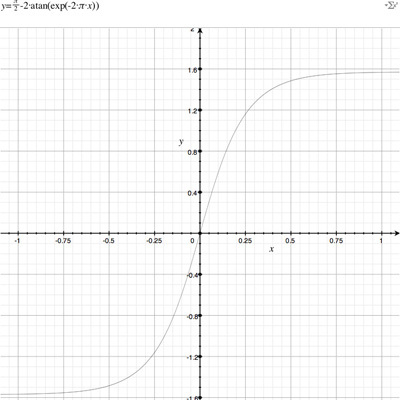 (x,y) are each normalised coordinates, -1 to 1. The Hammer-Aitoff map is limited to where (x longitude) >= 0. 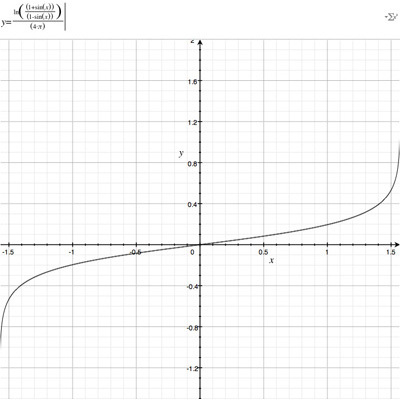 If Sx and Sy are not equal this results in a stretching along the axis of the larger scale factor. To rotate about a particular point apply the same technique as described for scaling, translate the coordinate system to the origin, rotate, and the translate back. Reflections about an arbitrary line involve possibly a translation so that a point on the line passes through the origin, a rotation of the line to align it with one of the axis, a reflection, inverse rotation and inverse translation. There are three prevalent coordinate systems for describing geometry in 3 space, Cartesian, cylindrical, and spherical (polar). They all provide a way of uniquely defining any point in 3D. The following illustrates the three systems. Rotations about each axis are often used to transform between different coordinate systems, for example, to direct the virtual camera in a flight simulator. These angles often go by different names, in the discussion here I will use a right hand coordinate system (y "forward", x to the right, and z upwards). As such rotation about the z axis will be referred to as direction, rotation about the y axis is roll (sometimes called bank), and rotation about the x axis is pitch. Further, a rotation will be considered positive if it is clockwise when looking down the axis towards the origin. Other conventions will be left as an exercise for the reader. The three rotation matrices are given below, note that they seem asymmetric with respect to the sign of the sin() term. A characteristic of applying these transformations is that the order is important. If the rotation matrices above are called Rx(t), Ry(t), and Rz(t) respectively then applying the rotations in the order Rz(t) Rx(t) Ry(t) will in general result in a different result to another order, say Rx(t) Ry(t) Rz(t). In what follows a particular order will be discussed and the other combinations will be left up to the reader to derive based on the same approach. The particular order of rotations applied here is to rotate about the y axis first (roll), they the x axis (pitch), then the z axis (direction). This is perhaps the most common order is usage in games and flight simulators. The "programmers" function atan2() has been used above which uses the sign of the two arguments to calculate the correct quadrant of the result, this is in contrast to the mathematical tan() function. While the above gives particular values for tx, ty, and tz there are a number of cases where the solution is not unique. That is, there are multiple combinations of Euler angles that will give the same coordinate transformation. Computer based modelling and rendering software seem to be split evenly between whether they use a left hand or right hand coordinate system, for example OpenGL uses a right hand system and PovRay a left hand system. This document describes bow to convert model coordinates and/or camera attributes when transferring models from one package to another. Each system is shown below, the difference involves how the cross product is defined...using the so-called left or right hand rule. Note that the exact orientation of the axes above is not relevant, y need not be "pointing up", z need not be pointing "into the page". All axes orientations are equivalent to one of the above after a suitable rotation. There are two ways to convert models between systems so that the rendered results are identical. The first involves inverting the x value (any single axes will do) of all vertices in the model and camera settings, the second uses the model and camera coordinates without change but requires a flipping of any rendered image horizontally. In what follows, the symbols p, d, and u will represent the vectors position, view direction, and up vector respectively. In this case the coordinates of the model and camera are used unchanged when transferring from one system to the other. As can be seen in the example below, the image ends up being horizontally flipped. This is usually the preferred method, perhaps mainly because it avoids worrying about which system one is using until the end of the process, the image flipping can be built into post processing image tools. Also, it means that if one makes a mistake regarding which system is being using it doesn't affect the rendered result nearly as seriously than if one got made a mistake in the first method. You may wonder why it is the horizontal axis that is flipped, what is so special about it? That arises because the flip is actually about the up vector which is traditionally vertical on the rendered image. The following classifies the most common projections used to represent 3D geometry on a 2D surface. Each projection type has a brief comment describing its unique characteristic. An oblique projection is a parallel projection where the projecting lines are not perpendicular to the projection plane. The precise projection is defined by two angles and . The first two transformations for xp and yp are all that is required to derive the transformation from 3D onto the 2D projection plane. The third trivial) transformation for z illustrates how an oblique projection is equivalent to a z axis shear followed by a parallel orthographic projection onto a x-y projection plane. 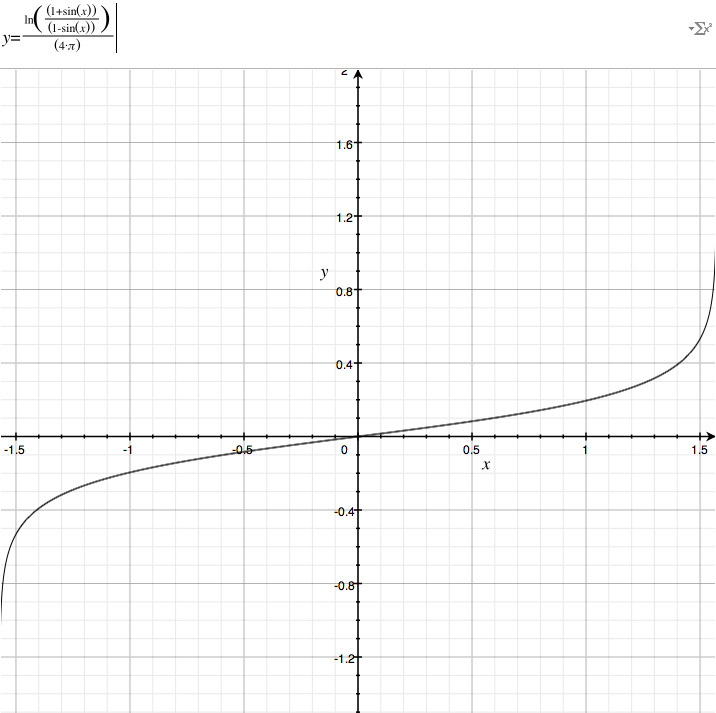 The x and y coordinate values within each z plane are shifted by an amount proportional to the z value of the plane. (ie: cos( ) / tan( )) so angles, distances, and parallel lines in any z plane are projected accurately, without distortion. The following mathematics and illustrations came from a project to undistort photographs taken of a flat piece of land. The photographs were taken from various angles to the ground and thus needed to be "straightened" so that relative area measures could be taken. The same technique could of course be used to intentionally distort rectangular areas. The conventional (Cartesian) method of uniquely specifying a point in 2 dimensions is by two coordinates. For the unit square below these two coordinates will be called mu and delta, they are the relative distances along the horizontal and vertical edges of the square. If the square above is linearly distorted (stretched) the internal coordinate mesh is also distorted but the relative distances (mu and delta) of a point P along two connected edges remains the same. 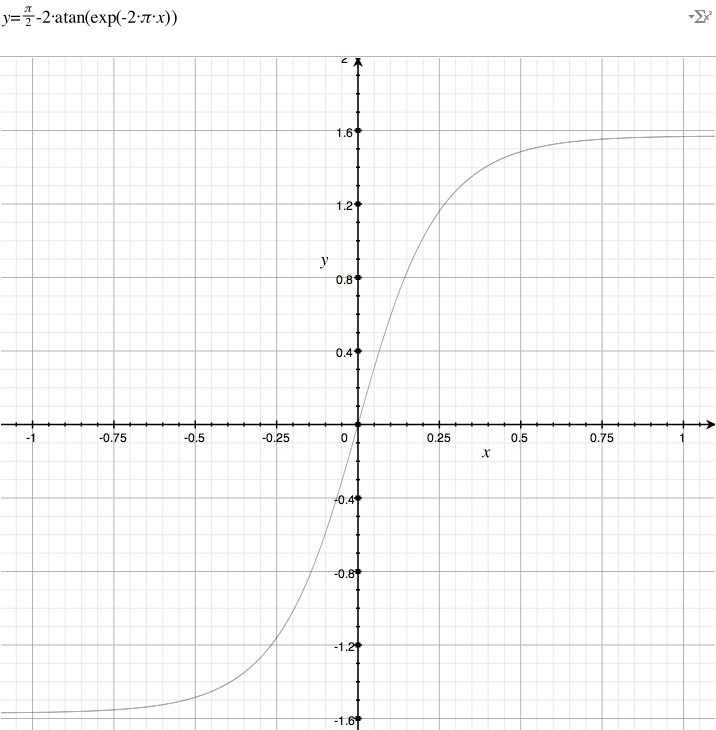 After solving the quadratic for mu, delta can be calculated from (1) above. Anamorphism is a Macintosh utility which takes a line drawing as a PICT file and performs various non-linear distortions upon it. The distortions available have been chosen from those which have been used historically by artists (and forgers). Each of the different distortions will be illustrated by using the following simple diagram. For the following examples an additional grid will be placed over the image to further illustrate the nature of the distortion. Each type of distortion has controls associated with it, these are indicated by black "blobs" at the current position of the control points. To vary these parameters simply click and drag the control points. The only PICT drawing primitives which can be used are line segments. Since the distortions are non linear, the distorted points alone a line segment do not lie in a straight line between the distorted end points of the line segment. Thus each line is split into a number of line segments in order to approximate the generally curved nature of the distorted lines. The result of this is distorted drawings with a much larger number of line segments. 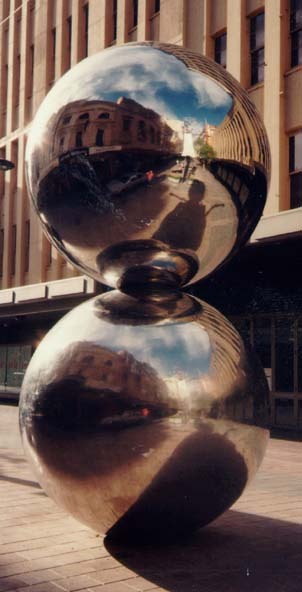 Reflective balls in the main street of Adelaide, Australia. The following illustrates the general form of various mappings in the complex plane. The mappings are applied to part of a unit disk centered at the origin as shown on the left hand side. The circle is filled with rays from the origin and arcs centered about the origin. 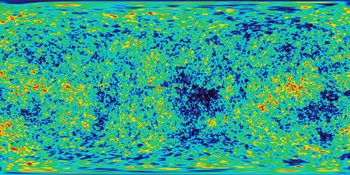 A series of coloured rays further illustrate the mapping orientation. The representation by computer of 3 dimensional forms is normally restricted to the projection onto a plane, namely the 2 dimensional computer screen or hard copy device. The following is a procedure that transforms points in 3 dimensional space to screen coordinates given a particular coordinate system, camera and projection plane models. This discussion describes the mathematics required for a perspective projection including clipping to the projection pyramid with a front and back cutting plane. It assumes the projection plane to be perpendicular to the view direction vector and thus it does not allow for oblique projections. Included in the appendices is source code (written in the C programming language) implementing all the processes described. In what follows a so called right handed coordinate system is used, it has the positive x axis to the right, the positive z axis upward, and the positive y axis forward (into the screen or page). Conversion between this and other coordinate systems simply involves the swapping and/or negation of the appropriate coordinates. The camera is fundamentally defined by its position (from), a point along the positive view direction vector (to), a vector defining "up" (up), and a horizontal and vertical aperture (angleh, anglev). These parameters are illustrated in the following figure. One obvious restriction is that the view direction must not be collinear with the up vector. In practical implementations, including the one given in the appendices, the up vector need not be a unit vector. Other somewhat artificial variables in the camera model used here are front and back clipping planes, a perspective/oblique projection flag, and a multiplicative zoom factor. The clipping planes are defined as positive distances along the view direction vector, in other words they are perpendicular to the view direction vector. As expected all geometry before the front plane and beyond the back plane is not visible. All geometry which crosses these planes is clipped to the appropriate plane. Thus geometry visible to a camera as described here lies within a truncated pyramid. The projection plane (computer screen or hard copy device) can be defined in many ways. Here the central point, width and height are used. The following will further assume the unfortunate convention, common in computer graphics practice, that the positive vertical axis is downward. The coordinates of the projection space will be referred to as (h,v). The units need not be specified although they are generally pixel's, it is assumed that there are drawing routines in the same units. It is also assumed that the computer screen has a 1:1 aspect ratio, a least as far as the drawing routines are concerned. A relationship could be made between the ratio of the horizontal and vertical camera aperture and the horizontal and vertical ratio of the display area. Here it will be assumed that the display area (eg: window) has the same proportions as the ratio of the camera aperture. In practice this simply means that when the camera aperture is modified, the window size is also modified so as to retain the correct proportions. Transforming a line segment involves determining which piece, if any, of the line segment intersects the view volume. The logic is shown below. Two separate clipping processes occur. The first is clipping to the front and back clipping planes and is done after transforming to eye coordinates. The second is clipping to the view pyramid and is performed after transforming to normalised coordinates at which point it is necessary to clip 2D line segments to a square centered at the origin of length and height of 2. The following utility was written to convert spherical projections into cylindrical projections. Of course only a slice of the spherical projection is used. 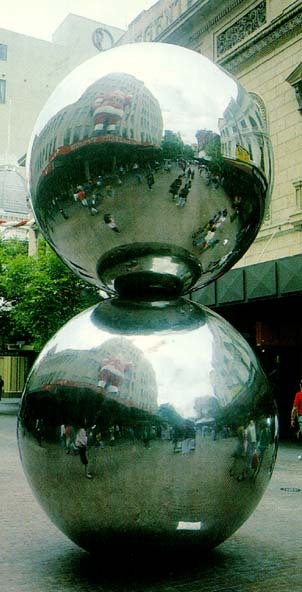 The original reason for developing this was to convert video content from the LadyBug-3 camera (spherical projection) to a suitable image for a 360 cylindrical display. This a command line utility and as such straightforward to script to convert sequences of frames that make up a movie. Click for original image (5400x2700 pixels). As with all such image transformations, one considers a point in the destination image noting that the point may be a sub pixel (required for supersampling antialiasing). This point corresponds to a vector in 3D space, this is then used to determine the corresponding point in the input image. Options such as rotations and flips correspond to operations on the 3D vector. The following show example transformations illustrating some of the more important options. In particular the ability to specify the vertical field of view and the vertical offset for the cylindrical image.